You may remember back in January I had posted about my resolution to learn to knit this year, beginning with a starter kit my mom had given me years ago. I am happy to report the first project is finished! Through the process I would learn that this project was doomed from the beginning. The kit included size 6 needles and chenille yarn, which any knitter will tell you could only be given to a beginner by a complete yahoo. Also, the kit's picture of the bag had been lost over the years, so I only had a memory to follow along with the pattern. So it began. My journey with this bag began by watching a DVD that came with the beginner's kit. I watched how to cast on maybe 20 times in a row until I understood. Then I did the same with a knit stitch. While I was able to figure it out enough to work on the project, my tension was tight to say the least. My finger tips were even sore from pushing the needles through the yarn loops. I could tell the yarn that came with the kit wasn't a good choice. Between that and my beginner's tension I wasn't able to identify a single stitch. A week or so later I saw Lynne from Boston Handmade at West Medford Open Studios. She was working on a project and showed me how to knit and purl. Wow! Larger needles and nicer yarn really made all the difference! 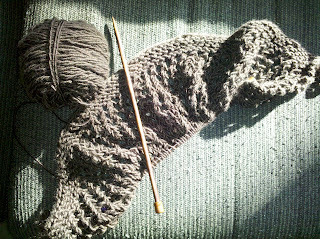 I grabbed myself some beautiful yarn and a scarf pattern and got started on my next project before the first was done. I didn't have it in me to go back to the bag of frustration when I had such nice yarn in front of me, so I started on the new scarf pattern. I still had tension issues (even snapped a needle tip! ), but I was getting better and more consistent. I got about 1500 stitches in, made a mistake somewhere, didn't know what to do, took all the stitches out, and started back from square one. And then again I got about 1500 stitches in and made another mistake without knowing what went wrong or how to fix it. I decided I needed a break and went back to finishing the bag. Boy, did my tension issues get worked out between the front and back piece of the bag! The second was about 2" wider! I knew that when I did it, but decided to go with it, knowing that the piece was already plagued by other problems from learning. I didn't mind at all having a piece to say it was my first, to have something to look back at to see how far I've come. Clearly my kit issues didn't allow me to be a perfectionist as I learned, and I was okay with that. 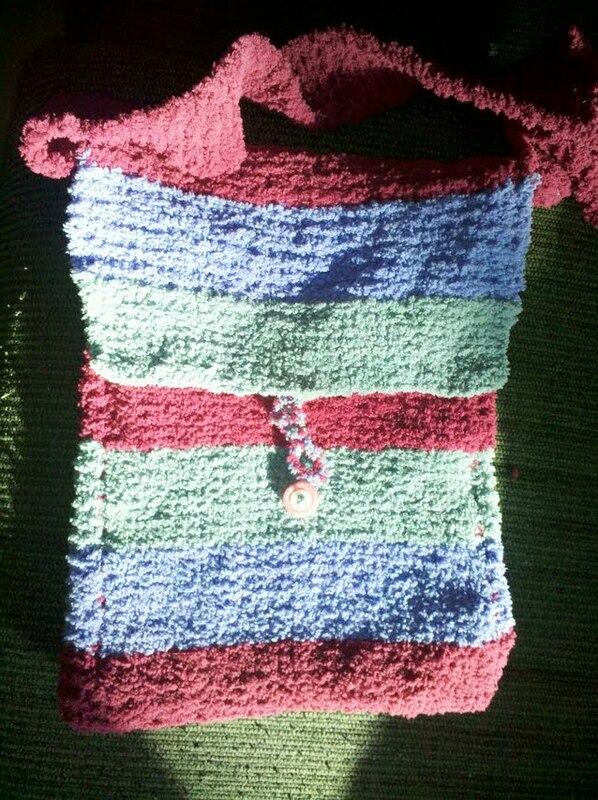 I decided I was going to make some adjustments on the bag since I had lots of extra yarn to work with. 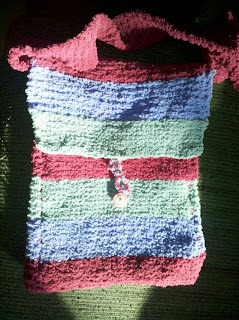 I added a flap cover to the bag by knitting an extra series of stripes on the bag piece of the bag. Since I did that I decided to add a button closure as well. I adjusted the strap from the pattern, making it a bit wider and a bit longer. There are many mistakes throughout, but I really like my bag and I'm proud of it. For as many things as I wasn't able to learn because I can't see the individual stitches, I learned just as many from working my way through the project. I'm going to head back to the scarf now that the beginner's bag is done, and that Diane helped me with the mistake when I saw her at the Bazaar Bizarre Union Made show. I'll keep you guys up to date on that project and other ones I plan to get started. since writing this post i'm sad to report there are serious issues with the scarf. again, i made a mistake and i'm not sure what happened. after attempting to try one thing to fix it, there is now a giant hole in it. :*( i'm hoping the knit shop in town is friendly can can take pity upon my new knitting soul by helping me. great job, karen! and... just try to see the light through that hole!!! youll get there!